The Satellite Feature Identification: Atmospheric Rivers lesson presents the global moisture transport phenomenon known as the Atmospheric River (AR). ARs are responsible for transporting the majority of maritime moisture from low to middle latitudes. Advanced satellite products, including Integrated Water Vapor and Total Precipitable Water, provide excellent observations of AR development and evolution. This lesson demonstrates the usefulness of these products in forecasting the impacts of ARs, especially when they are combined with numerical weather prediction products. Several AR case studies highlight the importance of using satellite information regarding ARs and allow the user to practice forecasting their impacts. This lesson is part of the series: "Dynamic Feature Identification: The Satellite Palette". The drawing features didn't include suggested answers which I have seen in other courses. Fantastic information. VERY helpful for forecasting in the Northwestern U.S.
A well paced, informative and intriguing study. The use of images and videos was the most useful in this seminar. Description are nice sometimes; however, in this case the images with the descriptions was very useful and easy to understand. Define an Atmospheric River (AR) and characterize its typical dimensions. 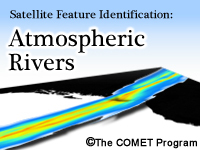 Describe the disadvantages of common satellite channels in identifying atmospheric rivers. Identify ARs using precipitable water/integrated water vapor and moisture transport thresholds. Characterize the subjective nature of defining an AR. Identify mechanisms that will help convert AR moisture into precipitation. Describe how the appearance of ARs on satellite can assist with forecasting excessive precipitation. Synthesize information from satellite and numerical weather prediction products to forecast the impact of an AR. April 2017: HTML and media assets in this lesson have been updated for current browsers and mobile devices.